A small solar panel makes an excellent battery charger for AA and AAA rechargeable batteries. Only a few components are required and construction is very simple making this a perfect first renewable energy project. Rechargeable AA and AAA batteries have a voltage of around 1.25 Volts when fully charged. Therefore 2 in series gives a total of 2.5 Volts, 4 in series 5.0 Volts. Therefore the common solar panel output voltages of 3 Volts and 6 volts, are perfect for charging 2 or 4 batteries respectively. We no longer sell solar panels ourselves in the REUK Shop, but there are plenty of well priced good quality panels here: 3 Volt Solar Panel and 6 Volt Solar Panel. 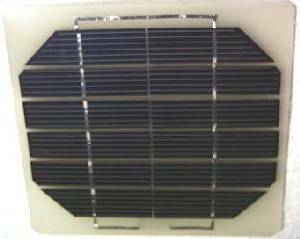 Details on making the simplest kind of Solar Battery Charger are available here, and here Basic 4 AA Solar Barry Charger Plans. Unfortunately this set-up has one serious limitation – the solar panel has to be well matched to the batteries to be charged or the batteries may be overcharged. If you later decide to charge batteries with a different capacity, you would need to change the solar panel. Also, 12 Volt charging solar panels are much more common (and also cheaper) than 3V, 6V or 9V charging panels and so many people would like to use a 12V panel (which they may already have) to charge their 2 or 4 AA/AAA battery packs. Current is the most important factor in any battery charger. As long as the voltage of the solar panel is greater than the total fully charged voltage of the batteries, the batteries will charge. If the current is low, the batteries will charge slowly. If the current is high the batteries will charge quickly, but are at risk of being overcharged, may overheat, and have their usable lifetime reduced. Therefore the next development step is to make a current limited battery charger. Since we are still making a simple solar charger, it will not automatically turn off when the batteries are full. Therefore we need to keep the charging current low enough that it will not damage the batteries even when they are fully charged. A current of around 10% of battery capacity gives the right balance of charging speed and safety – for example, 2700mah AA rechargeable batteries can be charged with a current of 10% of 2700 = 270ma and if left on the charger for a few extra hours should come to no harm. To charge the batteries faster a higher current could be used, but the chance of the batteries being overcharged would increase if charged too long. The LM317T is a voltage regulator chip. It can also be used with a suitable resistor to regulate current. Full details on how this works are available here in our guide to using the LM317T with LED lighting. The value of the resistor required is given by Ohm’s Law as 1.25V divided by the output current required. 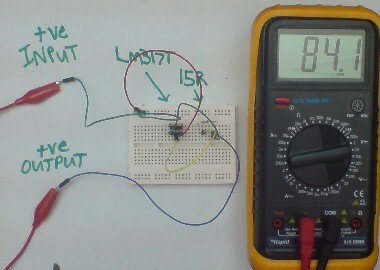 (The 1.25V is the regulated output from the LM317’s ADJ output.) Click here for our simple to use LM317 Current Calculator which will work out the current and power rating of the resistor required to get the desired output current for your batteries. The higher the input voltage and current, the more heat will be generated by the LM317T and resistor since the output current is fixed and the extra power has to go somewhere. The LM317T will cope with currents of up to 1.5 Amps and so will have no problem at all with small solar panels charging a few AA or AAA cells. Resistors are only available in certain values – e.g. 5.6 Ohms and 6.8 Ohms, but not 6.2 Ohms. Below is a table of some available resistor values together with the output current generated if each resistor is used in an LM317T current limiting circuit (R = resistance, I = current). Therefore using the table above we can see that to charge 1000mah AAA rechargeable batteries with a current of 100ma, a 12 Ohm resistor would be perfect. A 15 Ohm resistor would reduce the current and slow down charging, a 10 Ohm resistor would increase the current and speed up charging (but risk overcharging). 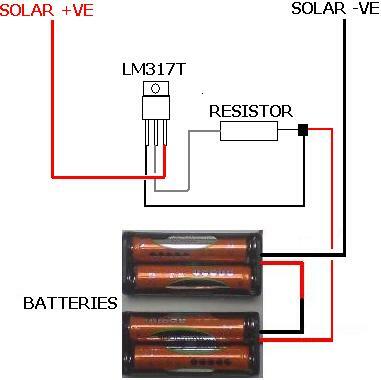 In this example we will make a solar charger using a 6 Volt 250ma Solar Panel to charge four 800mah AAA batteries. The batteries can be put into a couple of 2 x AAA battery holders and wired in series (link the positive output from one battery holder to the negative of the other). This gives us 4 x 1.25 = 5.0 Volts with a capacity of 800mah – therefore we want a charging current of around 80ma. According to the table above, a 15 Ohm resistor gives a fixed current of 83.3 milliamps which will be perfect. The power loss in the resistor is again given by Ohm’s Law as I * I * R = 0.0833 * 0.0833 * 15 = 0.10 Watts, therefore we can safely use a standard 0.25 Watt 15 Ohm resistor. For testing the circuit photographed below was built using prototyping breadboard. The circuit is connected between the positive output of the solar panel and the one free positive lead of the battery holders. 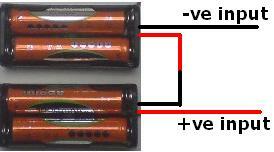 The negative lead from the solar panel should be connected to the free negative input of the battery holders. The positive lead from the solar panel is connected to the positive input of the current limiting circuit, and the output from that circuit connected to the free positive lead of the battery holders. You now have an improved solar charger which will send a fixed amount of current (sunlight permitting) to the batteries. Charging from flat would take around 10 hours of sunlight in this worked example and you do not need to worry about overcharging your batteries. A final enhancement would be to incorporate a simple battery status monitor using a Zener diode to light an LED when the battery voltage reaches the desired level, or even an automatic switch off circuit to disconnect the solar panel from the batteries when they are fully charged.